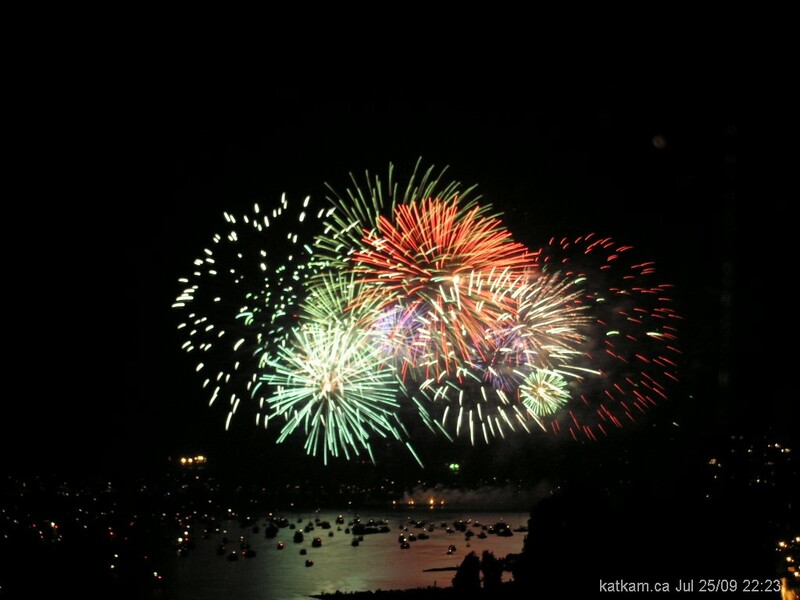 When we came to Canada it was for two years, because there would be a job opening up for the OS in his field at the University of Western Australia in Perth at the end of that time. Somehow we just stayed on in Vancouver and it was almost 50 years later that we went to Perth, on our recent trip to Australia. 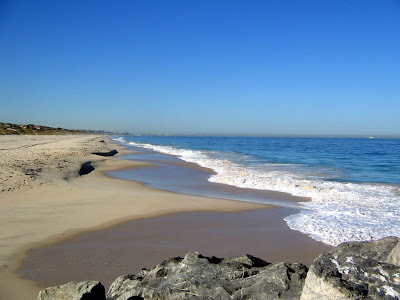 Now I always joke about Vancouver being at the end of the earth but in a way Perth is even more remote. As you stand on the beach, looking west at the Indian Ocean there is nothing between you and South Africa, 5415 miles (88715 km) away. If you look to the East, the nearest significant city is Adelaide, 1329 miles (2139 km) distant. 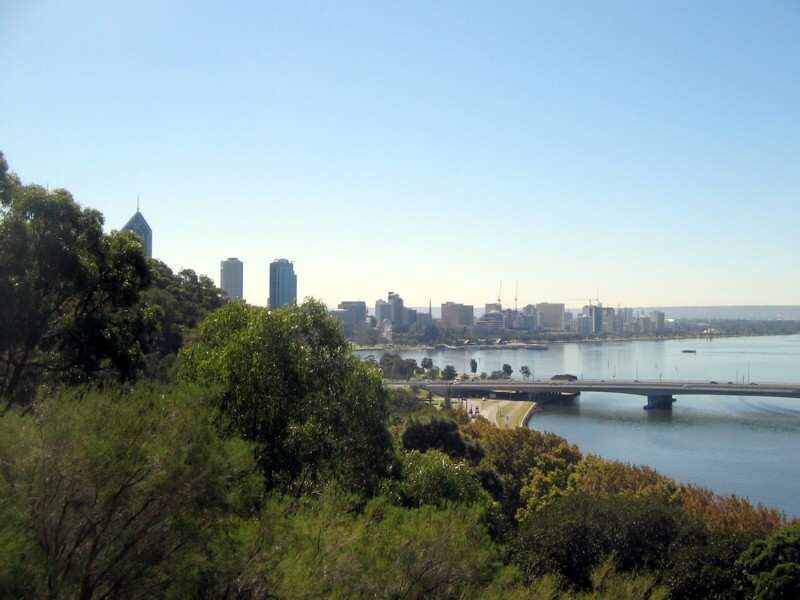 Perth is a beautiful city built on the banks of the Swan River and stretching to the Indian Ocean. It is a city of green parks. Yes despite the lack of rain, the parks and sports fields are unbelievably green, kept so by underground bore water. 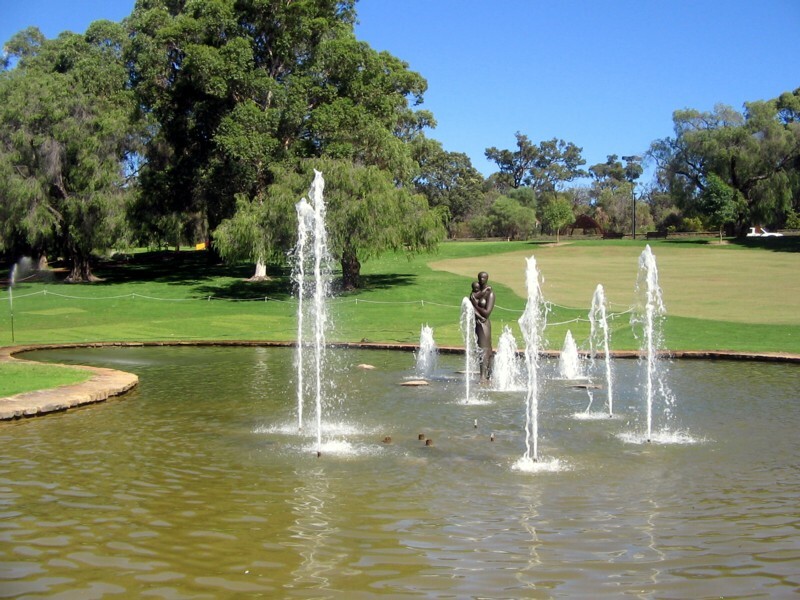 In fact there’s about 150 cubic kilometres of water under Perth and 40 per cent of its water come from underground. It is a city of the most beautiful trees as you can see above, in its 1000 acre Kings Park, where this beautiful avenue of Lemon scented gums make a splendid canopy for the main roadway. 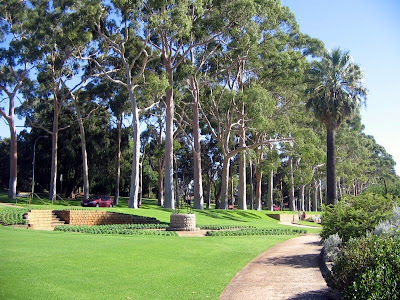 Situated on Mount Eliza the park is a beautiful mix of natural bushland, cultivated gardens and lawns and a botanical garden, all cultivated to endeavour to ensure the conservation of native biological diversity and cultural heritage icons, while providing for the diverse range of visitor interests. Many of the trees in the park are dedicated to a soldier who died in the First or Second World War and there are over 1100 plaques at the bases of the various trees. In fact the park is filled with many memorials including an eternal flame of remembrance. One of the most moving is the Bali Memorial, dedicated to the 16 Western Australians who died in the Bali Bombing on October 12, 2002. 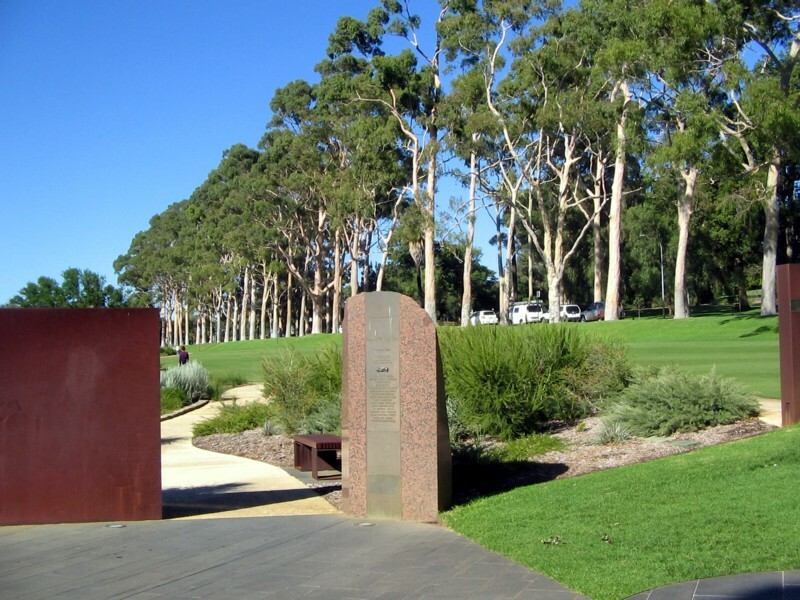 The memorial is beautifully place looking out over the Swan River to the Darling Range but in addition it is carefully placed so that a ray of sun enters the memorial at sunrise on October 12th each year. A view of the plaque with the names of those who died in Bali. My photo does not do it justice but there is an excellent one here which gives you a better idea of the configuration. 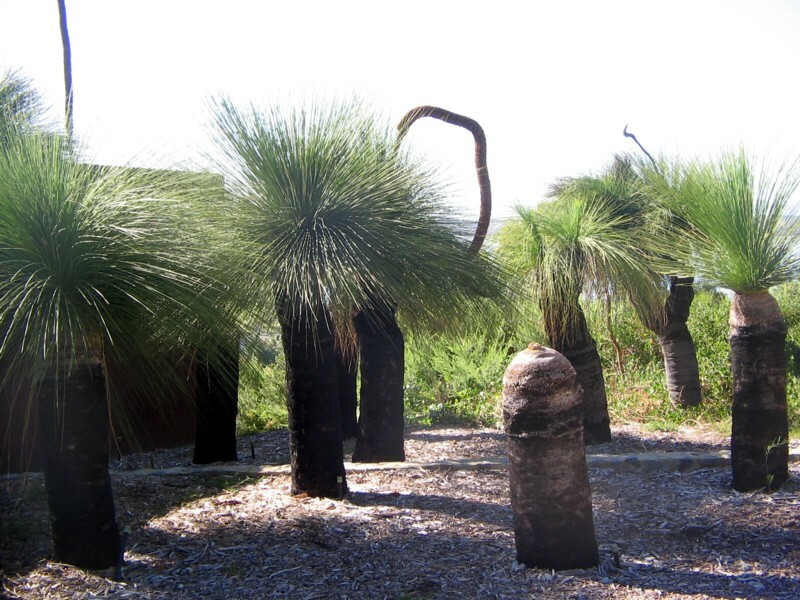 Adjacent to this memorial is this stand of 16 native Australian grass trees which are extremely slow growing, growing about 1 metre every 100 years so these are about two hundred years and they can be transplanted with care. 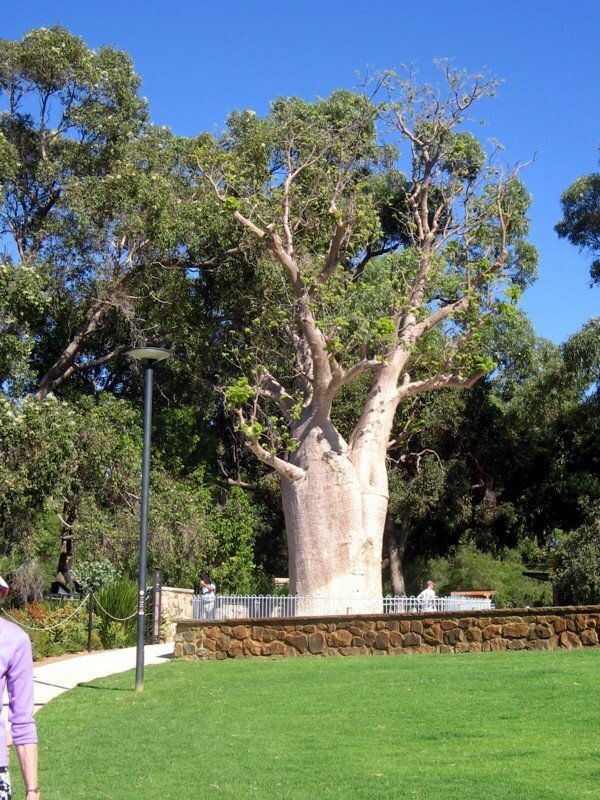 When I was a kid these trees were commonly called black boys but this in no longer acceptable. 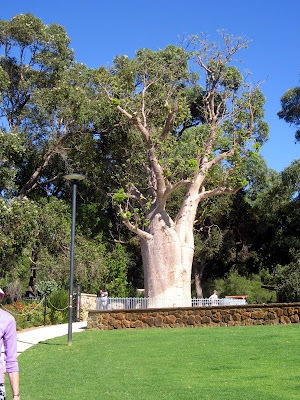 Another slow-growing interesting tree is the Australian Boab tree, native to the Kimberley region of Western Australia. 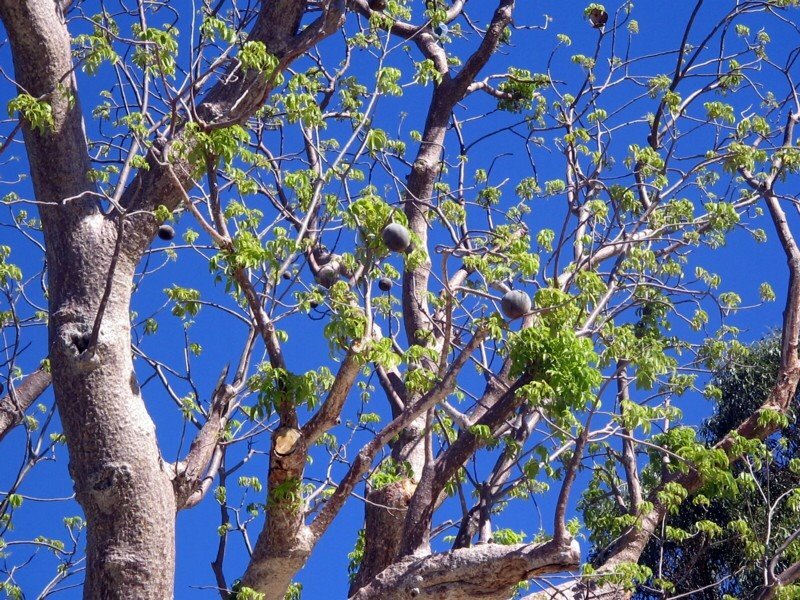 They are deciduous in the dry season, only leafing out when the wet season approaches. How do they know? They are already covered with leaves when the first rains arrive. Fruit/nuts of the Australian boab tree. 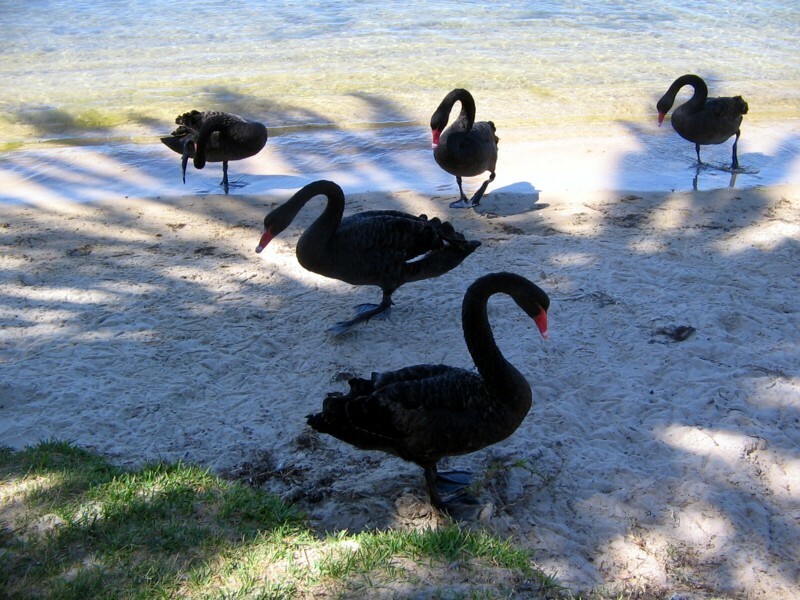 I think most people know that the black swan is unique to Australia but I have always associated it with Perth for some reason, although it is certainly found in other parts. They are to be treated with respect as they can do quite a bit of damage if they attack. However these were more interested in food as they hustled out of the Swan River to see if we would oblige. 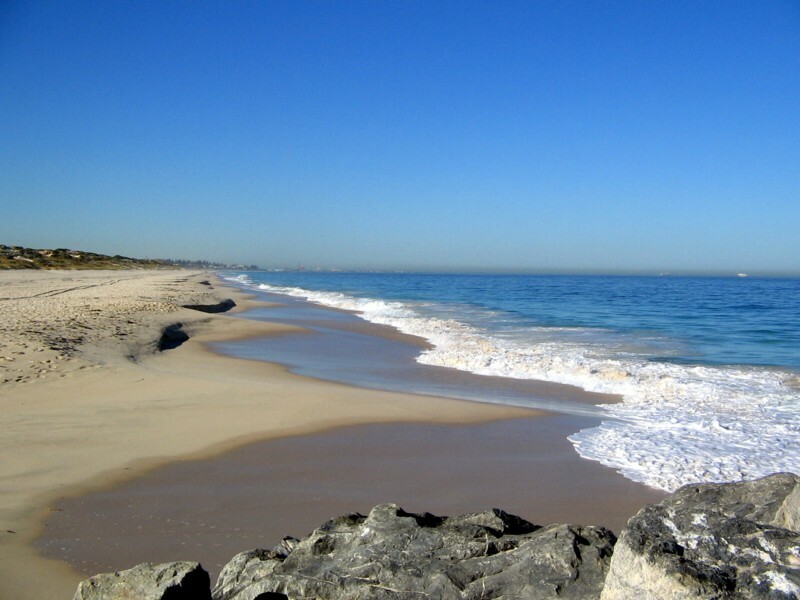 I think I could have settled quite happily in Perth, despite its isolation, if we had actually ever moved there, for as you can see it is a very beautiful city. It’s not that Australia is so backward that broadband is not common for it surely is the norm in the city. But when you live in the country your only option is the relatively recent introduction of satellite broadband which my brother in law still regards with suspicion. Although I notice the local library, well I should say the nearest library which is a forty minute drive away, has broadband, however they did admit that it was sometimes a bit iffy. Consequently I have been neglecting my blog since I finished the cruise and have been visiting the relatives. So here I am in the country, enjoying a very laid back visit on a horse farm. Well actually that is perhaps a bit grandiose since there are but six horses and it is only just under 40 acres in all. My brother in law was a rather senior civil servant and took retirement at 55 as do many Australian civil servants. In fact my nephew has just retired from the income tax department and is planning his retirement which he says involved doing nothing. They do like to enjoy the good life, these Aussies. Anyway my BIL loves horses although he did not learn to ride until he was fifty but he has been a lifelong horse racing fan as are so many in Australia. After a long search on the North Coast of New South Wales, he purchased 12 acres from a cattle farmer who was selling off some land to buy a new truck. In an ideal location, in the country but no more than forty five minutes from the coast and all those beautiful pristine sandy beaches, it is a very pretty property with its own small stand of gum trees in lovely rolling hill country and after he built a house and they moved here he began his new career as a racehorse breeder by buying a thoroughbred mare in foal and a riding horse who has a very fancy name which I cannot remember but has always been known as Nipper and for a very good reason. Now Nipper cost $250 fifteen years ago and he was a former stock horse. As you can imagine for that price he was obviously not very successful in his career as a stock horse and he was passed from owner to owner as quite a few tried to whip him into shape and each decided he was not worth the time. My BIL became his new owner and attempted to turn him into his devoted horsey companion without much success as he was truly a biter and he also tried to unseat his rider as often as possible. Like owning a sailboat or powerboat, owning racehorses is a sink hole into which you pour money but it has been a very happy retirement for my BIL as he has bred and raced a succession of racehorses from his original mare, albeit only in at the country race courses. But he has bred his last foal he says, as he surveys his little herd on his now almost forty acres and he expects this one to be his ticket to the big time. The next Phar Lap he tells me, although Phar Lap was a gelding and not a mare, but still the most famous horse in Australia. This one, the last of the line starting with Gildie the original mare, Blaze her daughter and Gilken her other daughter, followed by Tara who is Blaze’s daughter and finally Tara’s daughter who even though five months has yet to be named and is called simply the Foal. They all have fancy racing names but they have very simple names around here. Despite all being chestnuts the Foal is almost all black with a chestnut face and markings but it is too soon for her final colour to be known for sure. Her father is a very good horse and his foals are starting to win so my BIL is very hopeful that she will be a big winner and recoup all the money he has spent so lavishly on his little herd of mares and former riding horse, who have earned their retirement and lead the good life, eating their way through the paddocks which have been added to somewhat as he acquired more land and being fed hay and other exotic and expensive horsey treats. Nipper, at 28 and Gildie have to be fed a special senior horse diet and none were retrained to be ridden after their racing career was over. Occasionally Nipper, who is quite docile now in his old age, is ridden by a visiting grandchild or two but that is the extent of their usefulness, apart from this last mare producing the Foal. My sister in law is not quite so enamoured of these horses who, when she has to take care of them for any reason, for example when my BIL was thrown and broke his leg, tend to nip her and kick her if they get the chance. So she would be very happy to move to their other house at the beach but she knows that her husband loves these animals so much that it is not really an option any time soon. We have very much enjoyed our time here as we travelled between the beach house and the horse farm, in between feeding times for the horses of course. I must say it has been very relaxing to watch the rural landscape dotted with horses and the neighbour’s cattle and the weather has been gorgeous. Tomorrow we leave for Sydney to visit one of my school friends and then we are off to Perth for four days where the temperature will reach 34 to 35 degrees Centigrade this weekend, despite the fact that is Autumn. 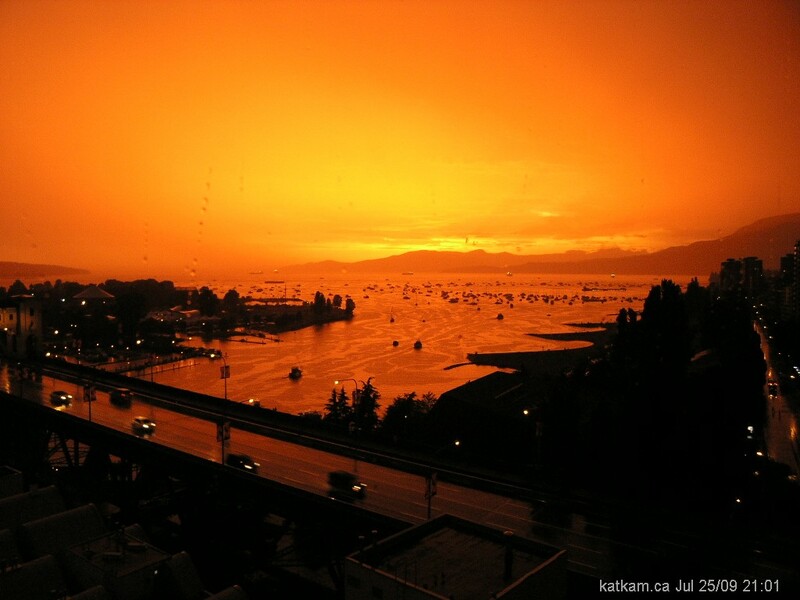 I cannot truthfully say I am looking forward to the heat but it will be great to catch up with our Perth friends who spent last year on sabbatical in Vancouver. I apologize that dial up does not allow photo uploading for this post but they will follow eventually I assure you. One of the downsides of visiting a country by means of a cruise ship is the superficial glimpse you get of that place, almost like a teaser so that if you find it really interesting you would want to come back again and explore it more thoroughly. Somehow I thought that New Zealand would be different since it such a small country and one is never far from the sea, so even if you sail around it, as we have done, you would get to see a large part of it at the various ports of call. But as we sail back to Sydney, having left New Zealand behind yesterday, while I have enjoyed it, I don’t feel seriously tempted to come back again. Yes it is a wonderful landscape and the climate is pleasant enough. Like the Australians, the New Zealanders are very friendly and welcoming and we have enjoyed the visits we made to the various ports and surrounding areas. One of the things I have missed is a look at New Zealand’s 150 plus mountains which are closer to the west coast and we have journeyed mostly up the east coast. Our visit to Fiordland, which is where the mountains of the South Island run into the sea was disappointing as the weather was bad and everything was socked in. We did go into several sounds including the Milford Sound, famous for one of the world’s most spectacular hikes, the Milford Track but unfortunately we could not see very much due to the inclement weather. I am sure that we would have enjoyed visiting the Southern Alps which form the spine of the South Island as I saw some spectacular photos of them. But let me tell you something of what I have learned about New Zealand on this trip. Quite a lot of it was ascertained in the wonderful Te Papa Museum in Wellington where we spent more than four hours and could quite happily spent several days. Like Australia and Antarctica, New Zealand formed as a result of the breakup of the great continent of Gondwana between 80 to 100 million years ago and the two main islands and the subsidiary islands of New Zealand are still being altered as to the landscape since they are subjected to the forces where the two tectonic plates, the Australia and the Pacific, come together. While they have rocks which are over 600 million years old they also have mountains which are a mere 3 million years. They are situated on the very edge of the Pacific Ring of Fire, the volatile fault lines which surround the Pacific Ocean making New Zealand a constantly changing land with active volcanoes and earthquakes, with the active volcanic region mostly in the North Island. Although the islands seem small in fact the actual land mass is about half the size of Australia. With a very high rainfall there are many fast flowing rivers and inland lakes and you are never far from water even away from the coast and this provides a very lush natural landscape. The plant and wildlife native to the region are unique, with the only two land mammals, both bats, although many flightless birds evolved, with the largest, the moa, which was the size of an ostrich now extinct, while the kiwi, the takahe and others still exist although endangered. 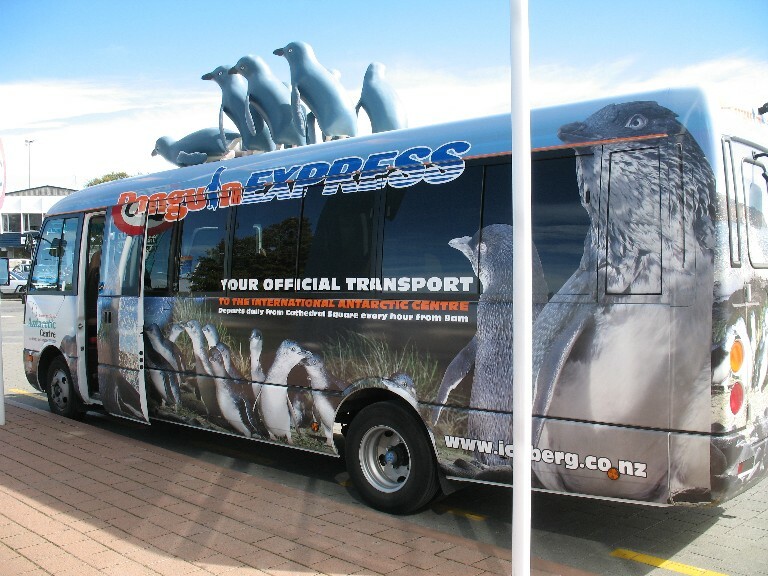 However many birds like albatrosses, gannets, muttonbirds, godwits come to New Zealand to breed and the seas abound with seals, dolphins and whales and even some species of penguin make their home in New Zealand. With its separation from Gondwana, came the tuatara, the sole remaining species of an order of reptiles which evolved about 220 million years ago and is still in New Zealand, Several ancient species of parrots, the playful but extremely intelligent kea and the flightless nocturnal kokako, are still found in this country. Originally 80% of New Zealand was covered in forest, but today only 25% remains and it is heavily protected. Most trees are evergreens, including the giant conifers: kauri, totara and rimu. The kauri was once a very important resource although it is no longer logged, however any that fall naturally can be used. It was exported both as timber and as kauri gum which was used in the USA to make varnish and linoleum. All over New Zealand it was used to build bridges, wharves, houses, furniture, roof shingles and even tramway rails. 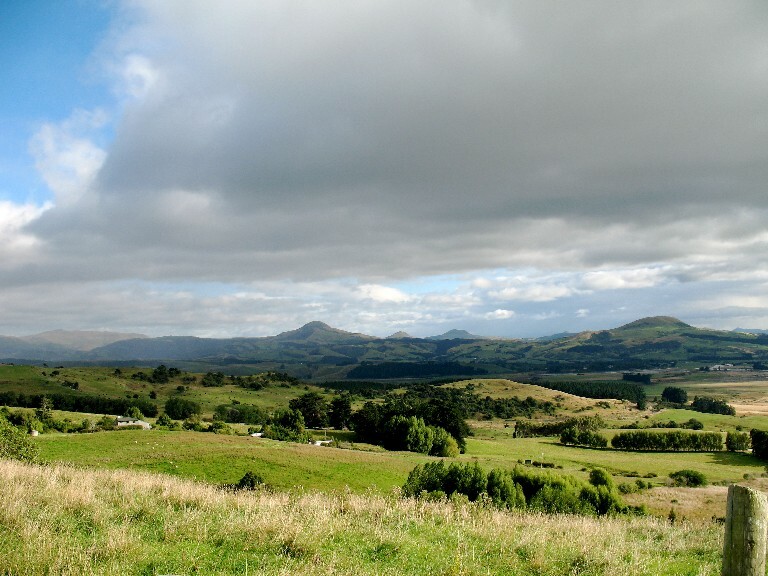 The deforestation of New Zealand in a relatively short time has converted 51% of the country to grasslands and more than half the exports are agricultural in nature and it is often referred to as the world’s biggest farm. A thriving forestry industry still exists but a lot of it is the “farming” of non native trees, like pines and redwood sequoias which grow to a harvestable size much more quickly in New Zealand. One of the results of this change in the landscape is the extinction of so many of the native species of animals as well as some, like the moa, being wiped out by hunting and the introduction of other non native species. While we think of New Zealand as a wool producing country, a country with more sheep than people and this is certainly true with a sheep population of 40 million rising to 76 million at lambing time (compare that to just over 4 million people), in fact the percentage of wool of the total exports has fallen from 35% in 1870 to 2.65% in 2005. So most of the lambs are sold and exported for meat. Of course the dairy industry too is a very big part of the economy, forming 18% of exports and New Zealand is well known abroad for its fine cheeses and butter. I can’t fail to mention New Zealand’s extremely successful wine industry which in two decades has moved from producing quite ordinary wine into the big time with over 400 wineries making first class award winning vintages and the old scientist has been busy sampling them. Then there is the kiwi fruit or Chinese gooseberry, so called after its country of origin. The growing of this fruit developed into a very big industry for the area of Te Puke in the North Island in the 1960’s as the kiwi became the trendy fruit of the time. While it is still a solid export for New Zealand other places like California and Chili now produce kiwi fruit in large quantities. I’ll talk about the Maori settlers in a separate post but what I consider one of the rather sad things is that, as they did in other countries too, the early settlers tried to transform New Zealand into a Southern Hemisphere pastoral version of Great Britain. Captain Cook introduced goats, sheep and pigs but only the pigs survived and they became wild and known as Cook’s pigs and even today they are hunted in some areas of New Zealand although with dogs and knives as one is not allowed to shoot them. Of course they introduced the rabbits and when they became a problem they brought in ferrets and stoats which in turn became a problem for the kiwis thus their numbers have been severely reduced and they are a threatened species today. Deer were introduced and they too soon became a pest and today are hunted and the meat exported. Possums became a huge pest after introduction as they caused devastation in the natural forest. All in all I would say the settlers did a number on the ecology in New Zealand, even the Maori with their introduction of the Polynesian rat or kiore which they originally prized as food but is now considered another terrible pest. Trout too were brought into New Zealand but while they have been quite successful and they are often raised in trout fisheries and released into the lakes and rivers there is no commercial trout fishing and the only trout you can eat is one you catch yourself, with a fishing licence of course. You will never see trout on a restaurant menu but they will cook one for you, if you front up with a trout and a valid licence. But today, although too late for many species, there is a growing awareness of promoting the health of the land for the needs of future generations and there is a large part of the land held in parks and reserves as conservation is now a core purpose of the parks system. New Zealanders make good use of the opportunities for outdoor “adventures” and there is plenty of choice of activity to get out there and enjoy the natural beauties of this small but very beautiful country. So yes, go there and maybe hire a car and drive around it and go where you wish to go, not where some cruise ship takes you. Frankly I think that would be a much better option. Christchurch is a very charming attractive city which we noted as we drove from the port of Lyttleton where the ship docked into the centre of the city of 308,000. It is very English in flavour, firstly named after the college at Oxford and the tiny shallow river Avon runs through it, where you can take a leisurely trip in a punt should you so desire. The gardens are very English in style and the flowers were especially beautiful as the city prepared for its annual flower festival. Arriving at the town centre, instead of opting for the Museum or the Art Gallery we bought tickets for the International Antarctic Centre which sounded very intriguing indeed. Christchurch has long been associated with the Antarctic since the Scott and Shackleton expeditions sailed from here between 1900 and 1912. But today all the New Zealand, USA and Italian groups leave by airplane from Christchurch to man their permanent year round stations on that continent. The centre is situated near the airport in the middle of the expeditions operations and until two weeks ago when the summer season officially ended it was a hive of activity nearby as the personnel and provisions were airlifted to their bases. We saw on the tarmac the US Hercules aircraft which remains ready in case of an emergency to go there, as with technical advances in flying the stations are no longer cut off for the six months of winter as they previously were. Antarctica is the fifth largest continent and is twice as big as Australia. Once it formed part of the large continent of Gondwana and it was warm and covered with trees and animals as has been ascertained by fossils found there. Eventually it broke apart and ended up where it is today, the coldest place on earth and also the driest with very little precipitation. The lowest temperature recorded there is minus 89.2 degrees Centigrade and winds have been recorded at 320 km per hour. It is completely dark for six months and survival for the personnel living there is totally dependent on modern technology. At Scott Base, the New Zealand station 30 people live there all year round while at the US McMurdo Station there are 200 people all year round. Scott Base was established in 1957 became permanent in 1961, while being completely remodelled in 2005/6. The South Pole is situated on a thick slow moving sheet of ice and moves about 10 feet every year so it is constantly being surveyed and relocated. There are usually about 35 research projects each year, involving about 200 scientist around the globe. Of course one of those is the study of the hole in the ozone layer situated over Antarctica. When measured in 1998 it was larger than the whole of the North American continent and had been steadily growing since the early 80s. With the banning of CFCs (chlorofluorocarbons) and halons growth has ceased and it is expected to begin to reduce in 2010 and be fully recovered by 2080. Considered the last true wilderness Antarctica is a very fragile environment. While many minerals have been discovered there there can be no mining for at least fifty years under the Protocol for Environmental Protection for the area, even if it were economically viable, although it may never be so. Few plants grow there, just a few algae, lichen and mosses and one species of tussock grass. However the region is home to many animals and birds, foremost of all the different species of penguin which I will leave for another post. Of the 43 species of birds, all but 5 live mostly at sea. However with a constant sea temperature of minus 1.9 degrees Centigrade there are many types of marine life which live there. Ten different kinds of whale are found there while seals live there year round, but do holes which are kept open in the ice for them to surface in order to breathe. There are 35 species of fish and over 1000 invertebrates in the region. Some have antifreeze in their blood and one species, the ice fish, has no red blood cells at all. All in all it is an area much richer in marine life than you might imagine. After we completed our tour of the centre we were taken for a wild ride in a Swedish made Hagglund all-terrain vehicle, used by the personnel at the Antarctic bases. Our driver took great delight in scaring the heck out of us as he put the vehicle through its paces on a special course designed to show its versatility on all types of land conditions and in the water for it is an amphibious vehicle. I found this a most interesting place to visit and was glad we had opted to go there. Afterwards we wandered through the lovely gardens in the city centre and by the river and we also toured the Cathedral which was decorated with flowers for the festival, including a carpet of flowers along the length of the main aisle which was truly beautiful. Photos will follow at a later date when internet access is not so poor. It is unbelievably slow on the ship, much slower than it has ever been before so it is truly frustrating, even trying to keep up with my email. I will never complain about my broadband service at home again.